Made of acrylic covered with Golden Metal Sheet and minakari work on it. Specially used to put dry fruits & sweets for gift in Indian functions & weddings & Festivals. All new DOUBLE MANGO shape for Elegant look. 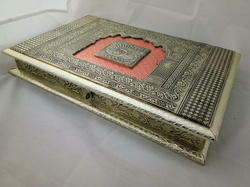 Backed by our skilled professionals, we are involved in providing Dry Fruit Box Meenakari Work. This White Double Booti floral pattern Meenakari metal Dry Fruit Box has Six partitions with capacity of 500 Grams mixed dry fruits. 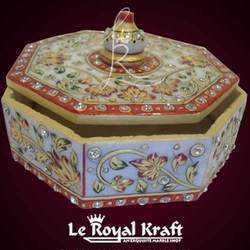 This handcrafted Rajasthani Real and usable dry fruit box is made of white metal and decorated with fine meenakari work. The box has 4 partitions for keeping dry fruits. A beautiful peacock and floral pattern is displayed in multicolour Meenakari work on top cover of the box. The white metal is rust proof and will remain shining for years. Peacock Meenakari Dry Fruit Box, Size: 8"*8"